Launched in 2015, the MS Majestic is a superior modern vessel offering spacious and comfortable accommodation for up to 36 guests. The 37 m cruiser boasts 18 fully equipped, air-conditioned cabins arranged over the main and lower decks. Communal on board facilities include an elegant air-conditioned salon-restaurant that seats all guests in a single sitting, a bar and an outdoor lounge area. 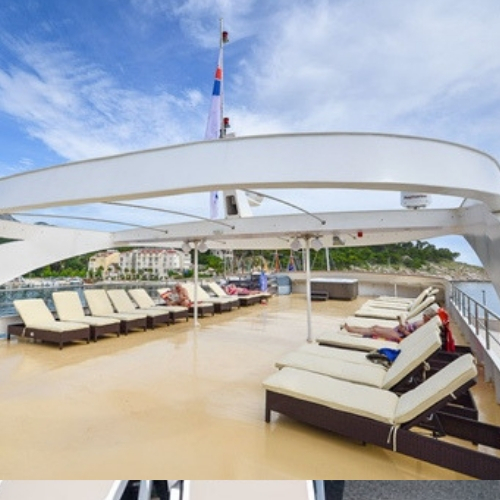 The sun deck features sun loungers and partial shading for enhanced cruise comfort. There is also a swimming platform offering direct ladder access to the sea, during the many scheduled swim stops en route to the ultimate cruise destination. The MS Majestic is a modern 37 m cruiser that is equipped with the latest safety features and amenities. 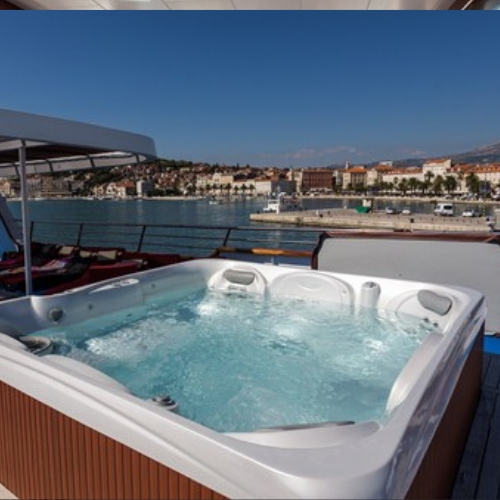 Launched in 2015, the vessel features 18 air-conditioned standard twin/double cabins that are furnished in a chic contemporary style. The public areas are spacious and inviting, and include an air-conditioned salon-restaurant with panoramic windows, a bar and a comfortable alfresco lounge. The large sun deck boasts an array of relaxing sun loungers and a canopied area that offers respite from the sun. To the rear of the ship is a swimming platform with ladders that lead directly to the sea. 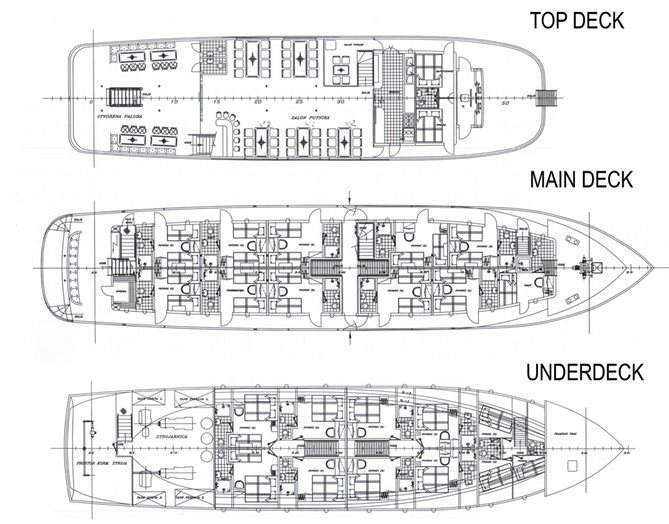 Arranged over the main and lower decks are 18 air-conditioned en suite cabins. The flexible standard twin and double bedding configurations accommodate up to 36 guests. Each cabin features a window or porthole and a private bathroom with shower. Functional amenities also include a wardrobe, in-room safe and hairdryer. 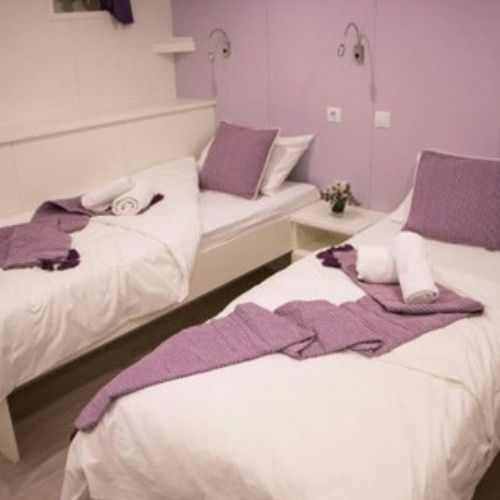 The spacious and comfortable cabins are decorated and furnished in a chic modern style with tasteful decorative accents. Whether dining, socialising or relaxing, the MS Majestic comfortably provides the perfect environment. 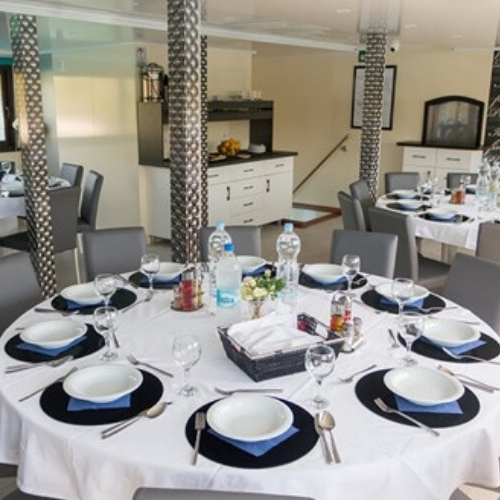 The ship’s spacious public areas include a modern décor salon-restaurant offering air-conditioned dining for all guests in a single sitting, and exceptional panoramic vistas. The bar area extends into an alfresco lounge that offers daily entertainment. During the day, the sun deck is the place to relax, soak up the sun and admire the scenery. A canopy provides shading for optimal lounging on the sun beds. To access the sea during swim breaks, head for the swimming platform located at the rear.